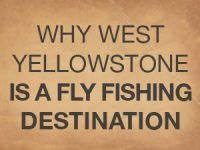 Learn the language of fly fishing terms for your West Yellowstone Vacation. Fly lines have a plastic coating over a special core. They are designed with weight unevenly distributed to make it easier to cast. 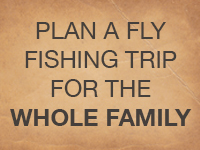 A special fishing reel with fairly simple mechanics designed to hold large diameter fly line. There are several different types of casting, not just the fancy A River Runs Through It kind. Casting is the motion you make when you throw your line and fly on the water (very precisely!) to catch big fish. Mending your line is very important after you have casted. You’re constantly mending, or correcting, the way your line and fly are floating in the water. Trout are very sensitive to unnatural movement. Fish rising to the surface to eat. This is exciting to witness as you know the fish are active and hungry. Also known as risers. Hooray! This is when a fish tries to eat your fly! Once the fish strikes your fly, you must pull the line quickly so the hook sets into the fish’s mouth. It’s a delicate balance. You don’t want to set the hook too softly or slowly because the fish will get away, but you don’t want to set too hard or fast because you might rip the hook out of the fish’s mouth. Celebratory exclamations after you have hooked a fish. When a fish escapes by getting off the hook or breaking off the line and taking your hook with it. This is heartbreaking. Successfully reeling in your fish. Depending on your personal philosophy (and state regulations), you can either keep or release your fish. But not until after you have taken a picture with it. When you see or feel fish nibble at your fly, but you don’t successfully set the hook. The number of bites you recount are always exaggerated at the end of the day.